There are a lot of motorists who don’t want their subwoofer to get in the way of passenger comfort. Others are hesitant to add a subwoofer because it can be an eyesore in their cabin. 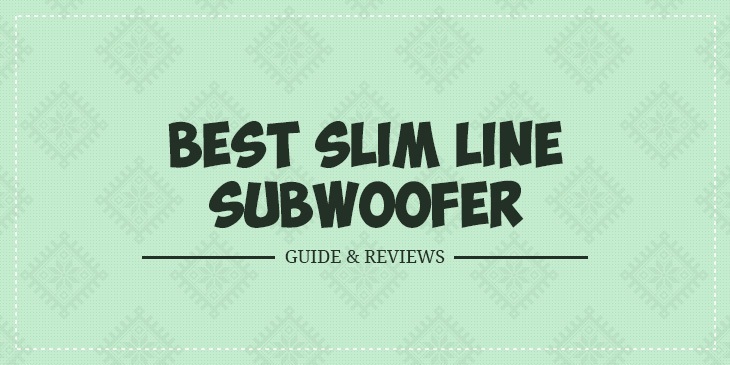 This is where the best slim line subwoofer can come in handy for drivers who want to improve their automobile’s audio system.The best slim line subwoofer won’t take up a lot of space in the cabin or in the trunk. As the name indicates, a slim line subwoofer is sleek and space-saving. It is also easy to conceal. So if you’re worried that a subwoofer can be a distraction in the cabin, then you might want to add a slim line subwoofer. KEF is a brand that has been around for decades. It is known for its good quality and durable subs, just like this sub enclosed in a slim and closed box design. The sub measures 15.6 inches long, 14.6 inches high, and 7 inches wide. Its slim design should enable you to fit behind the back seat or even under the seat of your car and truck. This subwoofer is part of KEF’s highly popular T series of low profile speakers. There are several qualities that make this model stand out. One of the first things that will catch your attention is the slim design of this subwoofer. The closed box design of this sub makes it so compact you can place it in the trunk or under the seats. You may even add this to your home theatre system. Either way, your passengers or guests may not even realize it is a speaker unless you tell them. Moreover, connecting this subwoofer should not be a problem. Simply connect the subwoofer to a receiver through a RCA connector and you’re ready to listen to your favourite tracks. This is another excellent and low profile subwoofer from KEF. It basically has the same features as the other subwoofer from KEF. It packs a punch despite its very slim design. And it has aninconspicuous design that would work well for motorists who want their subs to be unobtrusive. This sub is not the typical bulky cube you see online. KEF designed it to be as slim as possible. With a depth of just around 177 mm, its thickness is almost half of those of other subs. It will not eat up a lot of space in your cabin. Perhaps your passengers will not realize that you have a sub inside your truck, until you crank up the volume of your stereo. When mated with a 250 watt Class D amplifier, this subwoofer can reproduce bass that can give your sound system a tremendous boost. Many reviewers on Amazon.com are pretty happy with the clear, deep, and clean bass that this sub produces. You can also adjust the response of the subwoofer with its three-position bass boost control. This would give you the freedom to change the bass setting depending on your mood. Many owners on Amazon.com are quite contented with this subwoofer. There are those, though, who wish that the sub wasn’t that heavy. At nearly 30 pounds, this sub can be very difficult to move by yourself. Let’s face it: Infinity is a brand that doesn’t ring a bell at all. It’s not Pioneer or Kenwood, perhaps the two most trusted brands when it comes to car audio. But that doesn’t mean this brand can’t churn out good quality subs. This 150watt subwoofer is one top rated subwoofer, and a perfect example that not all top brands have the monopoly of good quality subs. This subwoofer is equipped with Infinity’s Metal Matrix diaphragm driver. It is designed to deliver fast and accurate response, and let you hear clean and more realistic bass. The bass levels remain clear and clean even if you set the volume at high levels. This can be attributed to the stiff aluminium cone of the sub, as well as its anodized sides that improve the strength and rigidity of the cone. This subwoofer measures 18.5 inches x 13.8 inches and 22 inches. With its size, this subwoofer is best placed in the trunk or even at the back of the seats. It’s quite heavy at nearly 40 pounds. It is housed in a low-resonance sealed enclosure. This subwoofer has been getting good ratings on Amazon.com, and this is partly due to its superior sound reproduction. Those who own it say that they can hear even subtle bass notes very clearly. This is perhaps the slimmest in our list of slim line subwoofers. With a depth of just 4.72 inches, this subwoofer will fit well under the car seat. It also has a remote control that lets users adjust bass boost levels. And it has thermal protection to ensure safety and extend its lifespan. This has a very compact design, making it a solid choice for motorists who are worried about space in their cabin. Its dimensions are 16.9 x 12.6 x 4.7 inches. It’s really designed for under the seat installation. According to some owners who tried to place it at the back of their seats, it would take some time for the sub to break in. But when it does, you will likely be impressed by how punchy the sub is. This subwoofer has thermal protection that prevents overheating of the unit. Many reviewers on Amazon.com can attest to the quality of this feature. Some say that they’ve mounted it under the backseat, where there’s virtually no ventilation. And it has worked perfectly well without any overheating. But there are also some drawbacks. One is that this may not be the most durable subwoofer out there. If we are to believe reviews on Amazon.com this sub has the tendency to just stop working. Worse the company’s poor customer support has been frequently mentioned in reviews on Amazon.com. Another ultra slim sub is this model from ZVOX. Its dimensions—26 x 14.5 x 3.5 inches--- give you an idea that you can slide this under your car seat without any troubles. Aside from its slim profile, there are other things I liked about this subwoofer. Perhaps what makes this sub different is that it is very easy to install thanks to its Bluetooth feature. Yes, this means that you don’t have to deal with a lot of wires with this subwoofer. Simply place it under your car seat, connect it wirelessly via Bluetooth, and you are good to go. Aside from the ease of installation, this subwoofer’s sound quality can match up well with any of the other subs in this list. One impressive feature is the AccuVoice. Simply push a button on the remote control to activate this feature. This significantly improves the clarity of the songs that you will be able to easily hum along to each tune.There’s also an output levelling feature. By pushing a certain button on the remote, you’ll be able to make loud sounds a bit soft, and soft sounds a bit louder. By doing so, there will be few jarring moments when commercials come on the radio.Aside from those features, this subwoofer is so affordable that you may not likely think twice getting it. There aren’t really a lot of things to hate about this subwoofer. These are all ultra slim subwoofers that you will find very impressive. What I love most about these subs is that you won’t have any problems at all in looking for a place for them. You can place these subs under the car seat, behind the back seat, or even in the trunk. These subs won’t take up a lot of cargo and passenger space.Moreover, these subs are designed to improve the audio quality of your car sound system. If you want to increase bass, or make the sound clearer, then you would find any of these subs a great addition to your car. Some of these models also have a remote control, so you can easily adjust the bass and volume settings without taking your eyes off the road. Whatever model you eventually buy, there’s one thing I am certain of—you won’t regret getting any of the subs listed in this article.